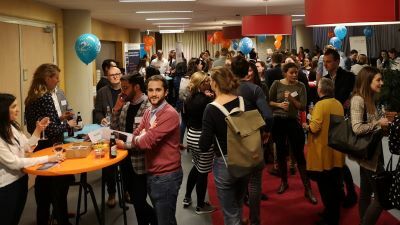 On March 20, 2019, students from the Governance and Leadership in European Public Health (G&L-EPH) and Healthcare Policy, Innovation and Management (HPIM) programmes participated in the annual Jump-start your Career in Healthcare event, sponsored by Maastricht University, Uni Partners and the UM Alumni Association. This one-day event offered a wide range of activities including lectures, panel discussions workshops and networking. The aim is to introduce current students to the labour market and to better prepare them for a future career. The career day provides insight into career opportunities that students may or may not have considered and provides a platform to network with members of the alumni, recruiters and career advisors. Event Coordinator, Ruben Drost, opened the day with a warm and enthusiastic welcome! 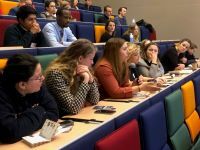 Following the welcome, Mieke Jansen, team leader-student psychologists and career counsellors at Maastricht University, kicked off the programme with inspiring and sound advice: “Jump as much as you can! You are perfectly prepared for the job market, even if you sometimes feel as if you are not. Careers are not linear. You will enjoy forming them as you go along. Just make sure you continue to learn and mind your well-being so that you will be a healthy professional, which YOU WILL BE”. Shortly afterwards a broad panel of experts from academia, consultancy, career counseling and alumni, discussed employability skills. Panel members shared their own experience and offered advice such as: “Focus on doing meaningful work, remain flexible and stay open to new opportunities”. They emphasized that both the goal and the road are equally important. They told us to be proactive and not to shy away from seeking advice from our network, offered advice based on their personal careers. We were encouraged to be inquisitive, ask significant questions, put ourselves out there … doing so will set off job opportunities. 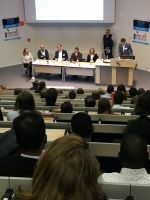 In response to one of the most intriguing questions from the audience, about the most appreciated skills from the side of the employer, the panel collectively identified four main competencies: technical skills, social responsibility, adaptability and self-awareness. In the current job market, these skills are in high demand and essential to building a good career. They also stressed the importance of accurate self-assessment, continuous self-reflection and proactivity. This discussion was not devoid of questions concerning gender issues, how they manifest in the work place and the recruitment process. The panel closed by sharing another important tip: “Don’t internalize any rejection after an interview. It is not personal, not about you. It is however, about the best match. On the contrary, these experiences will provide insights on how to better prepare for your next dream job interview. Stay confident. Reflect on how you could improve your CV or how you could better communicate during an interview. Keep applying, you are the winner in all cases”. After a short break, it was time for something even more challenging – five concurrent workshops, each one discussing different topics. The topics included technical expertise, Process Improvement in Health care – presented by Medtronic and Managing value based health care – presented by CZ. The other workshops concentrated on networking skills and offered tips on how to apply for employment positions in the digital era. The first workshop, entitled “Where will you be at this time next year?” Participants completed on-line tests in advance. The aim was to “get to know yourself better and to understand your competencies and work principles”. Divided into groups the students played games to determine the individual competencies and fundamental work principles according to the employment position associated with an alumnus. The purpose of this exercise was to let graduates seek out the job that was best suited to their competencies, skills and employment principles. The result is a mutual beneficial work satisfaction for both the individual and the employer. During the lunch break, students could have professional photos taken to use on their social media and/or LinkedIn profiles. Students felt confident and empowered, some even set up LinkedIn profiles right there on the spot. For example, in the job application workshop, Sibren Fetter, Career Counselor, provided practical tips on how to prepare job applications, especially since recruitment has undergone remarkable changes due to rapid technology development. Students learned how to make their profiles stand out from the others. They watched a video of an interview in progress. They learned new and interesting terminology related to the current recruitment field such as application tracking systems, digital footprints and vacancy analysis. The participants worked in pairs and played the role of recruiter. As such, the recruiter googled their partner. Not only did this provide good practice in being interactive, but also emphasized the importance of the first online impression. In the Medtronic workshop, participants really enjoyed being part of simulated Emergency room. Participants took on specific roles and carried out different tasks from patient admissions to discharging. 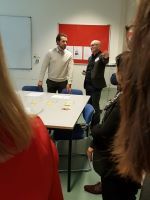 Afterwards they brainstormed the value of these processes, the outcomes, identified areas where improvements were justified, by using lean management concepts. They were able to re-design the process and make it more efficient. This workshop gave a lot of insight into what one might expect when you hold a management positions in a healthcare facility. The workshop was educative, fun and very relevant! 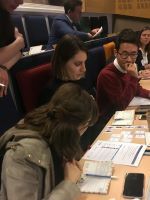 At the end, there was a question and answer period where participants could ask Medtronic about the company itself and what kind of interesting careers they have on offer. After what was a very long day, it was time to relax, have a drink and of course practice NETWORKING. In a relaxing environment, students were able to network with alumni, staff and speakers. They shared experiences, stories, and asked questions … inspiration about different career paths. These kinds of discussion are very important! Who knows …you may be talking to a future colleague or employer. Set the bar high and reach out to your dreams!